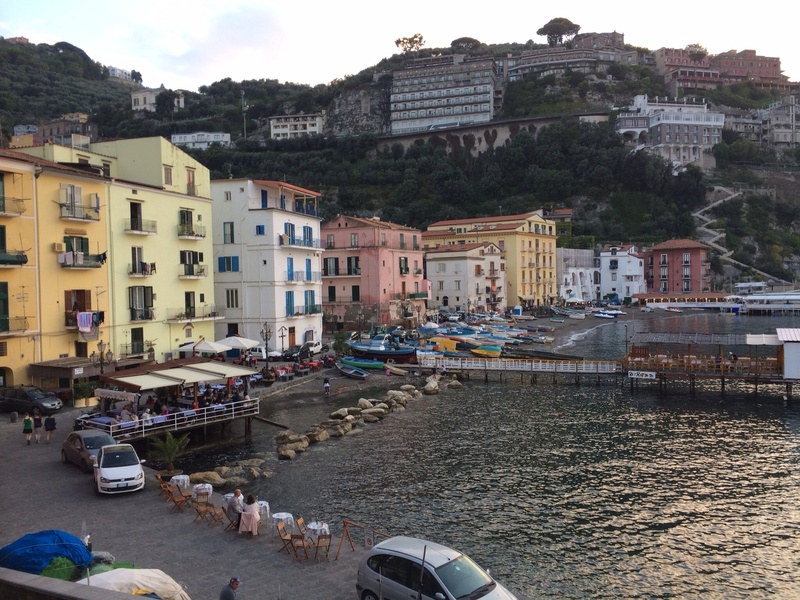 Naples in the morning and Sorrento by night. One of our turns of luck for the best was when our hotel room in Naples near the train station was flooded due to plumbing problems and the Mercure hotel chain moved us to their port hotel. So we only had to walk a short distance from the central station to the hotel, leave our bags there while we travelled to Pompeii and back that day and then that evening, the hotel paid for a taxi to take us down to their hotel on the other side of the city near the port. Today we sat and ate breakfast outside, at our hotel of chance, on the verandah watching the ferries come and go and working out the best route around the traffic for walking with our luggage to the ferry terminal. Before we checked out at 12 we wandered around the old part of Naples, up long narrow streets filled with cars, vespas, fruit stalls, washing and people dodging the traffic and each other. Then we came down to the main shopping streets filled with the exclusive, expensive shops. The old buildings are huge, ornate and speak of the wealth of the city in the 1800s. 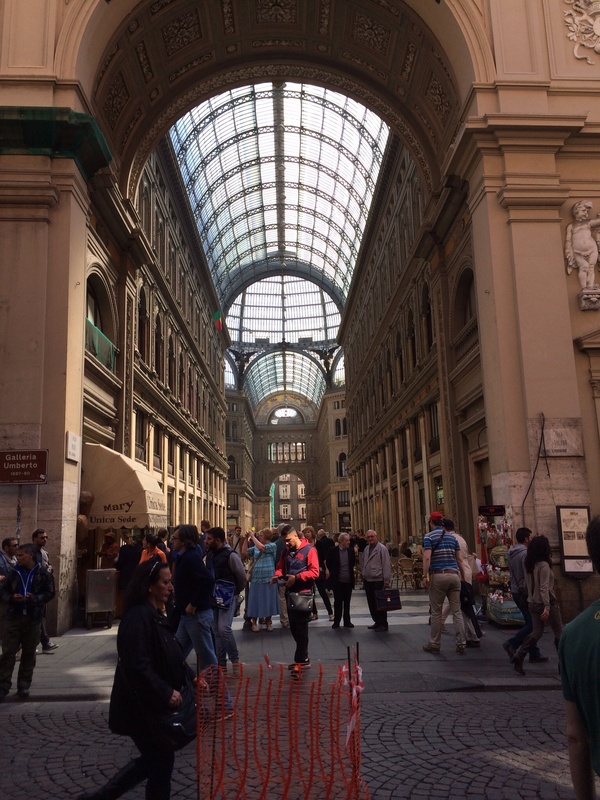 An amazingly beautiful arcade built in the 19th century in Naples. 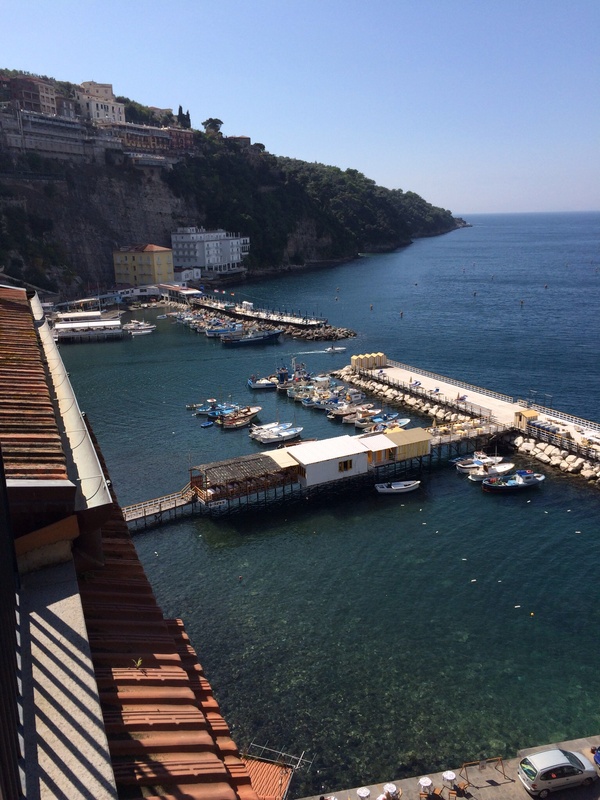 The ferry trip from Naples to Sorrento was quick and smooth. Sorrento is built into cliffs and hills. To get up to the top with our bags was going to be a bit difficult by walking so we decided to take a taxi. We had booked our B&B on Air B&B and the place that we were staying had great reviews on Trip Adviser. But we started to feel a little worried when none of the taxi drivers knew of this place where we were meant to be staying and weren’t exactly sure where it was. After a bit of a chat together with the other drivers our taxi driver decided that he knew where to go but he could only get us within 2o metres of our destination because the roads were too narrow for cars to go any further. Upon alighting we followed the numbers. We were to be staying at number 7. We could only find even numbers for the next 100 metres. Our hopes rose as we found 17 through to 9 … But no number 7. Everyone we asked had no idea where we were meant to go. So we put on my phones’ Tomtom. It could only tell us how to get there by car and wanted to take us around the city to where we had left our taxi. We had our luggage and this was not about to happen, so we retraced our footsteps up hills and down steps. Finally out of the blue and without any reference to any numbers around it we found number 7. Our B&B is beautiful with a sunny balcony and rooms with a view of the ocean. 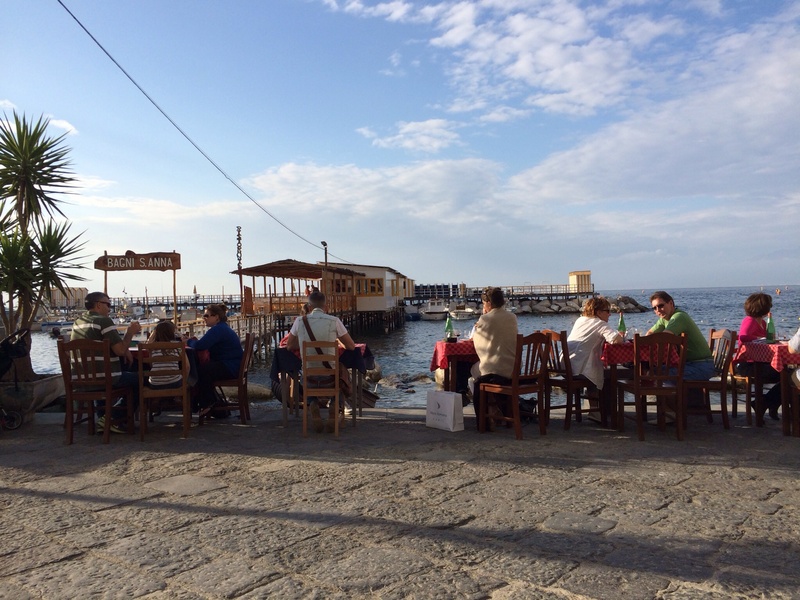 We are just a few metres from Marina Grande where the local fisherman have their own trattorias and we are in the quiet part of town away from the shops and expensive hotels. Also we cannot be disturbed by the sound of motorbikes and cars because people can only walk around here. As I lie in my bed I can hear the sound of the ocean and church chiming the quarter hours. This is the perfect holiday town and this jewel of a B&B was worth the search.